Rubies of the Viper is a fast-paced, suspenseful and romantic historical novel by Martha Marks, and a totally satisfying read. Set primarily in Rome at the time of Emperor Nero, Rubies of the Viper tells the story of Theodosia, who is a young single woman without family to guide or protect her when she suddenly inherits her family fortune at the death of her half-brother. The mystery surrounding that brother’s death, the confusion of competing suitors, the secrets surrounding her own background, the machinations of unknown enemies, and her conflicted relationship with her household slaves keep Theodosia off balance and in danger throughout the book. I loved how Marks accurately recreated the past, portraying the complicated social, economic, and political relationships of the Roman Empire through the relationships of the characters, while making me see, and smell, and feel the urban bustle of the metropolis and the cool luxury of a villa. However, my favorite element in the book is how Marks not only fully realized her main protagonist, Theodosia, but her development of the secondary protagonist, Alexander, a Greek slave. I learned to love these two characters, care about their futures, and look forward to seeing them in future novels. 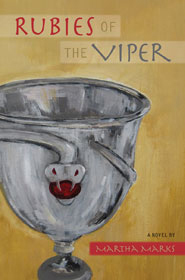 Rubies of the Viper will be Free on Kindle April 12-14. Thanks, M. Louisa, for your great review of my novel! I’m so glad you enjoyed it and appreciate your telling others about it. I have that one on my Kindle just haven’t read it yet. I am working my through all the books I couldn’t pass on. Thanks for the tip.